Honda Cars Philippines, Inc. (HCPI), Honda’s automobile business unit in the Philippines, unveils the much-anticipated All-New CR-V, the first ever diesel model in Honda’s local lineup. As the growing demand of the Filipino market of an all-around comfortable SUV, the fifth generation All-New CR-V is designed with a new and efficient diesel engine complemented by a bold and sophisticated exterior styling that matches its premium and comfortable interior. All of these improvements of the All-New CR-V aim to provide our consumers exceptional driving performance and ride quality. Honda will offer the All-New CR-V in three 7-seater diesel variants (SX Diesel 9AT AWD, S Diesel 9AT, and V Diesel 9AT) and a 5-seater gasoline variant (2.0S CVT). To serve and function as an all-around comfortable SUV, the 7-seater variants of the All-New CR-V are powered by a fuel efficient 1.6-liter DOHC i-DTEC Diesel TURBO engine developed under Earth Dreams Technology that produces amaximum power of 120PS at 4,000rpm and peak torque of 300Nm at 2,000rpm. The downsized diesel turbo engine is mated to a new 9 Speed Automatic Transmission with Electronic Gear Selector and Paddle Shifters that produces a powerful yet cleaner and more efficient output. The new gearbox also offers a number of real-world benefits to consumers. Low gear ratio ensures a quick and powerful launch while the high gear ratio gives lower engine speed at cruising speed giving the car lower noise level and better fuel consumption. On the other hand, Honda retains its 2.0-liter SOHC i-VTEC engine offering to the Philippine Market exclusively for the 5-seater variant. The 2.0-liter SOHC i-VTEC engine produces a maximum output of 154PS at 6,500rpm and peak torque of 189Nm at 4,300rpm and is mated to a new Continuously Variable Transmission (CVT) developed under Earth Dreams Technology for better fuel efficiency. The chassis was also engineered from the ground up to provide a more agile and confident handling. Its wider front and rear track combined with front MacPherson strut and rear multi-link suspension promotes a more responsive turn-in and cornering. An enhanced Real Time All-Wheel-Drive (AWD) system will be available for the top-of-the-line SX Diesel 9AT AWD variant. This allows the power and torque to be distributed across all four wheels, allowing the driver to have maximum traction and stability on any road condition. To top of these improvements, the All-New CR-V’s ground clearance was raised to 208mm for the SX Diesel 9AT AWD variant while other variants stand at 198mm, giving the All-New CR-V superior versatility and all-weather confidence and control. The redesigned exterior of the All-New CR-V comes with a dynamic and aggressive design that surely meets the aesthetic requirement of the Filipino market. Revolving around its exterior concept of “Modern Functional Dynamic”, the sharp-lined front grille reflects an aggressive, yet sportier look that is further complemented by signature Honda Full LED headlights. New High Beam Support System is now available for the SX Diesel 9AT AWD variant which enables the All-New CR-V to automatically change from low to high beam in dark driving conditions. 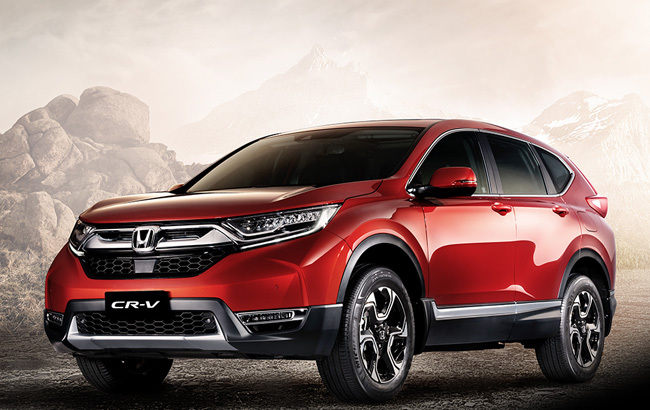 The wide and muscular fenders, tailgate spoiler, and headlight integrated Guide Type LED Daytime Running Lights (DRL), gives the All-New CR-V its modern and dynamic stance. Furthermore, a Panoramic Sunroof, Power Tailgate, and Auto Rain Sensing Wipers are exclusively available to the SX Diesel 9AT AWD variant giving it a more luxurious feel together with ease of use of the vehicle. 18-inch Aluminum Alloy Wheels for the SX Diesel 9AT AWD, S Diesel 9AT, and 2.0S CVT variants complete the overall exterior look of the All-New CR-V. Complementing the bold and sophisticated exterior styling, the interior of the All-New CR-V is built on a foundation of smart utility design with 7 seats, comfortable fit, and high tech intuitive controls. Upscale features, black leatherseating, and premium accents for all variants give the All-New CR-V a more luxurious feel. The All-New CR-V offers impressive space and comfort featuring a cabin designed to comfortably accommodate up to 7 passengers. Upon entry, a highly informative Full Color Thin Film Transistor (TFT) Instrument Cluster that come standard across all variants welcomes the driver. The driver seat of the top-of-the-line variant (SX Diesel 9AT AWD) is fitted with an Electronic 8-way power adjustment with 4-way power Lumbar support thatgives the most comfortable seat configuration for every driver. The second row seats of the 7-seater diesel variants features a 60:40 Split Rear seat configuration that slides and recline for an easy ingress and egress of the passengers at the third row. Air conditioning vents and two USB charging ports at the center console are also available for added comfort and convenience. Moreover, the third row seat of the 7-seater diesel variants comes with 50:50 Split Reclining seats and additional conditioning vents with independent controls are available to comfortably seat its passengers. Furthermore, the All-New CR-V’s unparalleled cargo capacity can handle a variety of cargo requirements, depending on the customer’s needs. The 7-seater diesel variants’ flexible seat configuration can accommodate 472Liters of cargo space with the third row seats tumbled and 967Liters of cargo space with both the second and third row tumbled. The 2.0S CVT variant on the other hand can comfortably accommodate 5 passengers with 522Liters of cargo space behind the rear seats. Keeping its passengers comfortable and entertained, the All-New CR-V SX Diesel 9AT AWD, S Diesel 9AT, and 2.0S CVT variants are equipped with a 7-inch Touch Screen Display Audio system. This system offers an intuitive operation for multimedia and hands-free telephone functionality, and Multi-View Reverse Camera Display with Dynamic Guidelines. In addition, SX Diesel 9AT AWD and S Diesel 9AT variants’ 7-inch Touch Screen Display Audio packs a Navigation feature and additional controls for its Intelligent-Dual Zone Automatic air conditioning system. With the class leading performance and top-class interior, driver and passenger’s safety remains a top priority as the All-New CR-V is equipped with Electronic Parking Brake (EPB) with Auto Brake Hold, Agile Handling Assist (AHA), Driver Attention Monitor, Driver and Passenger Airbags, Vehicle Stability Assist (VSA), Hill Start Assist (HSA), Anti-Lock Braking System (ABS) with Electronic Brake Distribution (EBD), Emergency Stop Signal (ESS), Multi-View Reverse Camera with Dynamic Guidelines, and Low Tire Pressure Warning system. Additional convenience and safety features such as LaneWatch Camera, Side Airbags, Side Curtain Airbags, and Walk Away Auto Lock feature will also come in standard for the SX Diesel 9AT AWD, S Diesel 9AT, and 2.0S CVT variants. To further ensure the safety of its passengers, the SX Diesel 9AT AWD variant is equipped with a state of the art Honda SENSING technology. It is a suite of safety and driver assistive technologies where it aids the driver to prevent or effectively respond to dangerous driving situations. It features an Adaptive Cruise Control (ACC), Low Speed Follow (LSF), Collision Mitigation Braking System (CMBS), Lane Keep Assist System (LKAS), Road Departure Mitigation (RDM), Forward Collision Warning (FCW), and Lane Departure Warning (LDW). With the All-New CR-V's advanced technological features together with its modern, functional, and dynamic exterior, its top class 7-seater cabin, and uncompromising safety, the 7-seater Diesel SUV can surely offer the most rewarding drive any customer is looking for.